(We are currently working on changing our pictures to reflect the change). If you have any questions please email us anytime!! Buy before 1:00PM Est time and your order will be shipped same day. hen Wheat Grass, Barley Grass & Alfalfa Grass are combined it creates a seriously powerful & tasty powder! It is super rich in Chlorophyll, has essential AMINO Acids, and all of the Vitamins & Minerals your body needs! 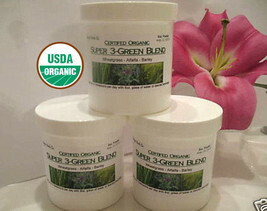 Our Super Green is 100% USDA Certified Organic. It is made from only the highest quality powders. It's very rich green in color and has a slightly sweet taste. It's texture is very fine powder and mixes well with almost any beverage including juice and purified water but it works even better in Smoothies, or Yogurts. Directions: Mix 1 TBS with juice or desired food or beverage up to 2 times daily. Shipping: $5.95 anywhere in the USA. *Our 1 pound is actually slightly less (about 1/4oz) less than a pound so we are able to ship USPS First Class. *We always combine shipping. If you are interested in buying more than 1Lb or other products please feel free to contact us. If you have any questions please feel free to contact us anytime!! WE ALWAYS COMPLY WITH ALL FDA POLICIES. THIS PRODUCT IS NOT INTENDED TO HEAL OR REVERSE ANY ILLNESS, DISEASE, OR DYSFUNCTION.THIS PRODUCT IS NOT FDA APPROVED. PLEASE CONTACT YOUR PHYSICIAN PRIOR TO USING.